Design Thinking is an intellectual, academic buzzword that’s hiding a transformative shift in the way some companies do business. The Design Thinking movement has gained a lot of attention in recent years because of its controversial suggestions about who can and should design. I’ve personally been critical of the faux “designer lifestyle” that seems to surround both education about Design Thinking and its practitioners. 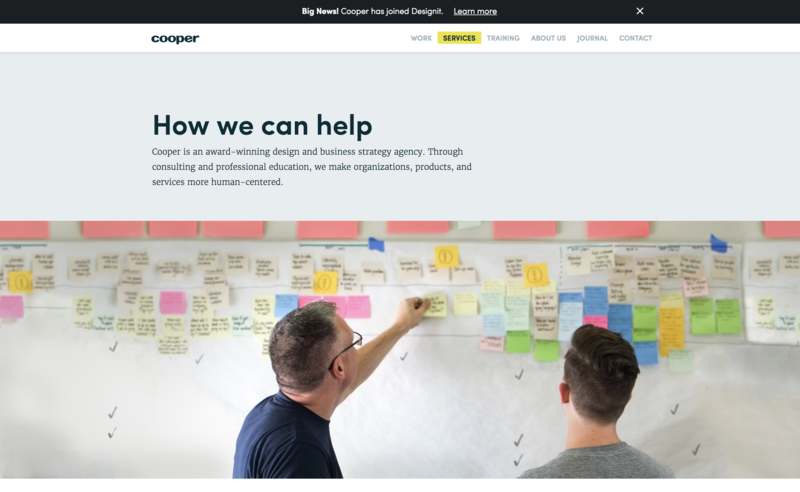 However, if you can set aside the “everyone is a designer” controversy and ignore the photos of walls covered in sticky notes for a moment, design thinking has an important lesson for all designers and the people who hire them. If you’re not familiar with the term, here’s a quick primer in Design Thinking. The term encompasses many proprietary takes on design process from various agencies and universities, but essentially, design thinking is the idea that everyone within an organization should be involved with and responsible for design and that design is a top-down effort. Great design requires everyone, including company leadership, to be involved and make shifts in the way the company operates in order to use and implement design well. The backlash against design thinking is often that it sounds too academic (which I think is a fair criticism) or that it’s silly to say everyone should become a designer (which despite much of the buzz is not actually what design thinking is about). However the controversy and grandstanding surrounding this movement hide a critically important idea. I imagine that the term “Design Thinking” began as an effort to make design sound more important to stakeholders and clients, which certainly isn’t a bad thing in my book, me being a designer and all. However, this effort to lend the design industry more credibility has caused Design Thinking to become a misnomer. Design Thinking experts teach CEOs and other non-designers how to think like a designer. Stanford’s D-School teaches a complex design process it calls “Design Thinking”. And so do IDEO, Cooper, and many others. Design decisions are business decisions. Every single detail within a design is connected to the business strategy, goals, and vision. Right now you’re probably thinking this claim is silly. Choosing a font for a logo is a business decision? Deciding whether to make a button green or blue is a business decision? Yes. They are. Design is about taking something a business has and presenting it in a way customers can understand, purchase, and use. Or, a UX expert might say that design is about understanding customers so a business can make the right thing for them to purchase and use. Regardless of how you look at it, the business is an essential part in the equation of making a design. If I found that the user is a millennial who wants to purchase a skateboard, I’d design the button very differently than if the user were an HR director buying payroll software. The tiny decision about how to design a button is influenced by the data I have about the business and its intended customer. Each detail of the design is connecting the business and customer on a deeper level. A green button isn’t just a green button. It’s an opportunity to appeal to a specific segment of the population—an audience the business wants to reach. Every detail within a design is intimately connected to the business strategy. Design Thinking teaches us that design isn’t just a pretty picture—it’s the implementation of a business vision. So, clients, if you want a great design, you need to tell your designer about your business. And, when you make decisions about your business, you need to consider it from a design perspective. If you switch audiences, you need to adjust your design to accommodate that business decision. Just as every business needs to understand its ideal customer, every design needs to understand its user. And designers, there is a lesson here for you too. We can’t just make pretty pictures and draw cool things anymore. Savvy clients will demand more than that. You need to connect your work to the business’s goals and demonstrate that you can partner with your clients. You need to distill your clients’ needs and goals into a usable—and, yes, pretty—picture that customers will like. Design Thinking is a silly term. But its implications are significant. Design is powerful because it can affect our subconscious opinions, influence behaviors, and appeal to specific tastes. Designers can drive profit—but only with a clear understanding of what the business is doing. Businesses can profit through design—but only if you make design a core part of your strategy and values.